Drifting. You know, that thing where drivers get cars to go sideways and make lots of noise and smoke, destroying tires along the way. It’s spawned a whole sub-culture of modified cars around the world, and it’s now gotten a very fancy and legit FIA-backed competition. With Japan being the birthplace of drifting, it made sense for the inaugural FIA Intercontinental Drift Cup to be held in Tokyo. Drifting getting its own FIA-backed competition is a big deal, elevating the motorsport up into the big leagues with Formula 1, WEC, and WRC. The first event was brought to you by promoter Sunpros, who’ve been hosting and promoting D1 Grand Prix since its inception. It took place in Odaiba on the very same “circuit” used by D1GP. It’s a small and tight track made on a car park in the middle of Tokyo. This is about as real-life Tokyo Drift as you can get. Though it’s a one-off event, there’s a possibility it might spawn a full championship in the future. Obviously drifting has had official competitions across the globe for years, but the FIA getting involved seems to signal just how big and mainstream the sport is getting. The IDC brought together the top drifters from around the world. Everyone who competed had won a championship prior. The 24 drivers represented 15 countries, from Japanese locals to drivers from Lithuania, Thailand and United States among others. Bringing the top drivers from each region to compete for the first international drifting competition was about as close as it got to a motorsports equivalent of Olympic figure skating. It also showed what a drifting event sanctioned by the FIA could look like. It’s big, loud, and as inaugural events go, pretty well done. The grand stands weren’t as packed as they would be at say, at a D1GP round, but it wasn’t bad. The most notable difference from this FIA drift event to a local Japanese one was the bilingual host. The event itself was lively and entertaining. I was invited by Nagayama Tomohiro, photographer from the Nichiei Racing GOODRIDE team. It’s a very international team with drivers Zhang Shao Hua from China, Feng Jen Chih from Chinese Taipei, Auttapon Prakopkong from Thailand and Matt Field from the United States. All their drivers have won or got a podium finish at a regional drift event. 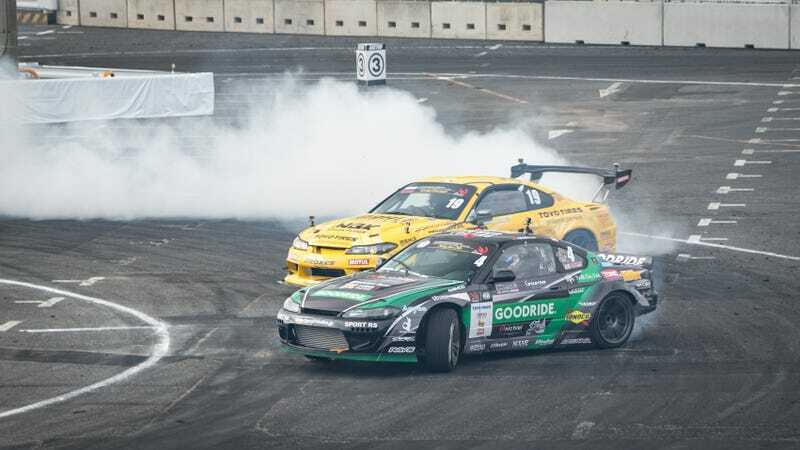 Matt Field was the Champion of Formula D Irwindale 2016, both Hua and Chih were Champion of China Drift Championship (2013 and 2011 respectively), while Prakopkong finished in 3rd Place D1GP Thailand in 2012 and 2014. It was unfortunate both Field and Chih only made it up to the Top 16 in the IDC. The cars on the team included a Nissan 350Z sporting Rocket Bunny over-fenders and Anyca livery. Their Silvia S15 also has a Rocket Bunny kit on it with a ducktail for good measure. It also comes fitted with a big turbo from JP Turbo, brakes from Endless, wheels from RAYS, and of course rubber from GOODRIDE. I went on that Sunday for a couple of hours to see what it was all about. I’ll admit I hadn’t been to many drift events in the past. I went to the Odaiba round of the D1GP in 2015 very briefly. Being able to watch these top drivers and cars competing was much more entertaining than I had anticipated. There was something mesmerizing about seeing a car aimlessly dance around a course in a matter of a few seconds with the sound of abuses tires and a heavily turbocharged engine whooshing with the air around you filling with smoke. The crowds there were just as happy. It was a mix of lone older men, families, and tourists coming together to spectate a global event of a sport that originated in their backyard. Support for local drivers was summed up best by the the kid next to me jumping up and fist pumping every time a Japanese driver came out. The electronic scoring system is the same as what’s used in the D1GP, after all why try and meddle with a tried and tested system. Judges look for speed, changes in yaw, and angle stability over the five sectors in a course. Competitors go on two runs throughout the day; first the Solo Run and then a Battle Run afterwards. Solo Run is pretty straight forward where scoring is done based on a criteria with emphasis on angle and speed. Each sector carries different percentage for scoring, with high speed and big angles earning extra points. Points are lost for spins and large corrections. The Battle Run is a one-on-one tournament style competition. Drivers are paired off based on their scores during the Solo Run. Drivers take turns being the lead car and chase car. The lead car will try to get away from the chase car while outperforming the chase car with bigger drifts. The chase car will also try to take attention away from the lead car with better or longer drifts and keeping on the inside of the lead car. Masato Kawabata, in the number 13 Nissan GT-R, was the overall winner of the first IDC after scores from each run over the weekend were tallied up. Second place went to the Arkady Tsaregratsev from Russia, with Daigo Saito rounding up the podium. While the FIA haven’t confirmed a future World Championship series, something similar the Formula 1 Grand Prix, there are surely enough drift circuits around the world for it to happen. It’s not like you need a lot of space to set up a drift track, the one in Odaiba was only on a parking lot. The backdrop of the Tokyo skyline behind it did add to the drama. Yet the FIA getting their hands on drifting has divided fans. On the one hand, regulating drifting with the FIA’s rulebook adds cachet and legitimacy to the motorsport and could spawn more competition around the world. With an organization as big as the FIA behind it, drifting could get the funds and promotion it needs to reach further than the 40 countries that currently have drifting completions. On the other hand, there’s fear it’ll take away some of the unique and accessible appeal—one thing that’s great about drifting is how grassroots it has been. There’s fear among some that it’ll become expensive, bureaucratic and brand-laden like Formula 1 and full of rules restricting freedom. While it’s unlikely a specialized drift car will need to adopted like in F1, part of the appeal of drifting are seeing the variety of cars with individual customization battling it out against each other. It was an interesting first event, and it’ll be fascinating to see where the FIA will take drifting from here. Let’s hope it stays one of the true motorsports of ordinary weirdos.